looking for an easy-to-use vineyard management system? 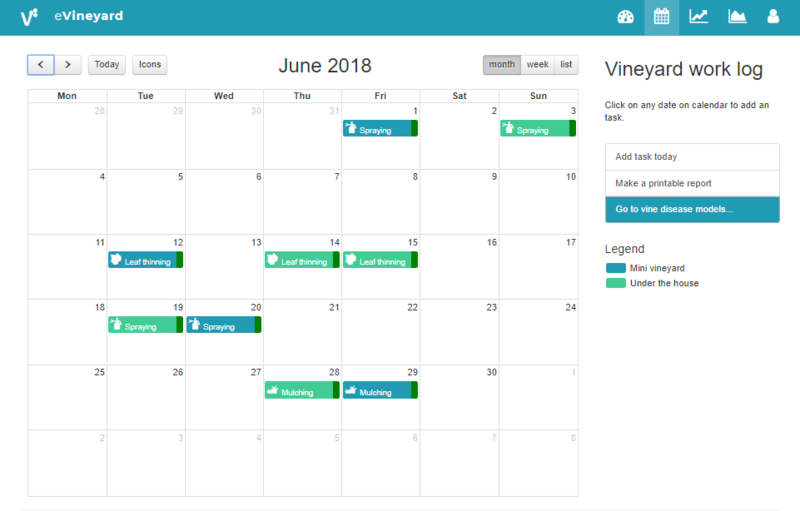 Keep your vineyard work calendar in a digital way across all devices, understand your vineyard better, apply pesticides with confidence and optimize quality through smarter irrigation. eVineyard Lite offers vineyard data analytics for family-owned vineyards. By keeping your vineyard work activities inside eVineyard, you not only rest assured that all data will be available for you anytime on any device, but more! Get a custom mildew and irrigation forecast for each of your vineyard blocks, based on vine variety, vineyard properties, weather parameters, and your past activities. Have an additional, completely objective information, for more confidence when deciding about when to apply plant protection products. For ultimate decision support, eVineyard Lite offers compatibility with all major weather stations on the market today, so you can connect it to your weather stations with a few clicks. Decide about irrigation quantity precisely based on weather data. Save water and money with precision irrigation. If you ever decide, you may even connect eVineyard with automated irrigation control that allows you to control irrigation remotely and even automatically - and save up to 20% of water. Register at eVineyard and with a help of wizard let us know all your needs and wishes. Our local distributor will contact you afterward with an offer, schedule a meeting with you, and help you set-up the system. Manage your vineyards with precision, irrigate smarter, produce higher quality grapes, and save time and money. Register for local support today! Downy mildew (Plasmopara viticola), Powdery mildew (Oidium), and Botrytis pressure information based on local weather (air temperature, humidity, ...). 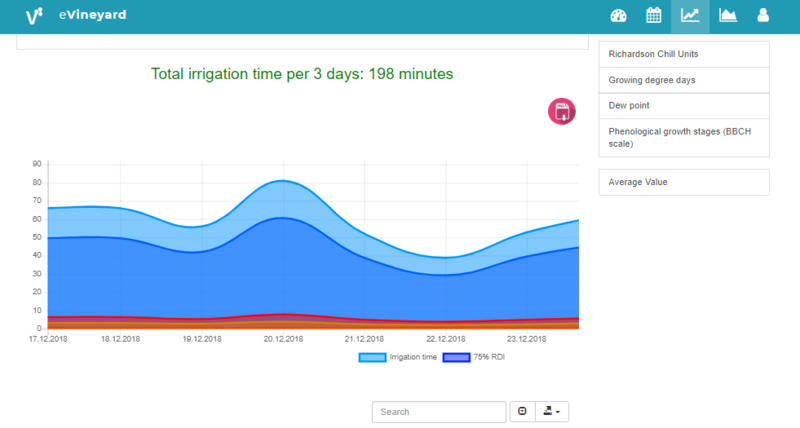 Daily recommended irrigation time, based on evapotranspiration and your irrigation system characteristics. Completely objective, unbiased information about the status of your plant protection, based on your past pesticide applications and disease pressure. Warnings and updates about your vineyard status over e-mail, so you are never too late to observe your vineyard and decide about the necessary activities. 1. Who is eVineyard Lite for? eVineyard Lite is for winegrowers managing family-owned winery with 1-30 hectares (2-50 acres) of vineyards, who want to optimize spraying and/or irrigation in their vineyards. It's perfect solution also for winegrowers who want to lower the costs of grape production by learning more about their vineyards and applying precision viticulture methods, with low investment and hassle-free use. 2. Do I need any special equipment and/or knowledge to use eVineyard Lite? No, the goal of eVineyard Lite is to be the most easy-to-use vineyard management system on the market, so no special expertise or knowledge is required. You only need a smartphone, a computer, or a tablet with an Internet connection - and you are ready to use eVineyard Lite. Yes, we offer 15-days free trial for anyone interested in analytics, spraying, and irrigation optimization in their vineyard. You can start the trial right here. 4. Once the trail is over, how can I continue using eVineyard Lite? After the 15-days free trial is over, you will notice a PayPal button on the top of the eVineyard dashboard. Click on that button, and continue to payment through PayPal. In case you don't have PayPal account, and don't want to set up a PayPal account, then simply send us an email, and we will send you the invoice to pay. 5. How can I cancel the eVineyard Lite subscription? Is there any commitment? There is no commitment - you can cancel your account at any moment, any month of the year - and we will stop charging you the subscription. Under the user's settings, click a "delete account" button. In 24 hours, eVineyard team will get in contact with you to delete the account, and cancel the subscription. You can also cancel the subscription directly through PayPal. There is no lock-in, so you can cancel any time, and stop paying at that moment. 6. Do I have to stay a customer for a certain period of time? No, there is no lock-in! If you decide to finish after 15 day trial, you can do so. If you want to finish after 6 months, you can do so. Simply cancel the subscription, and we will stop charging you, and stop providing you the eVineyard Lite service. No hooks! If you have any other question, please don't hesitate and send us an email. Have a question?